If you have ever considered raising chickens, it’s a lot easier than it sounds. 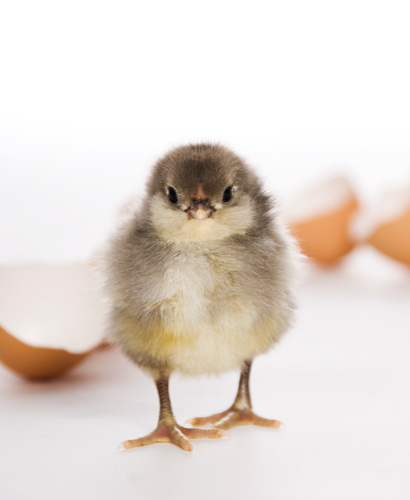 One way is to start with day-old chicks purchased from a farm store or mail-order catalog. Mail orders usually require a minimum shipment of 25 chicks, so if you just want three or four hens, ask friends if they’d like some chicks and you can combine your orders. Another option is a local farm-supply store that can order exactly what you want when they place their orders. Be sure to specify that you want all females when you place your order. Roosters are not recommended for backyard beginners, as they are loud and aggressive and hens will lay better without the roosters around. Before the arrival, set up a “brooder” for your new chicks. A brooder is a box (a plastic storage box will work well) with a heat source hanging over it. 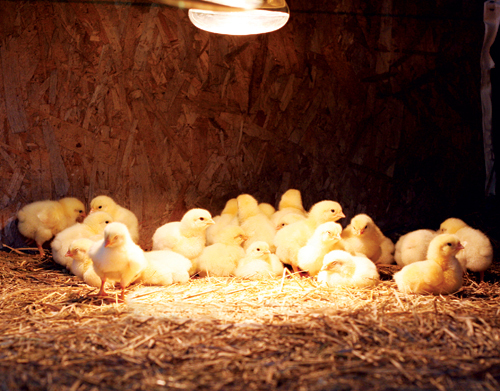 You can either buy a lamp at the farm store, or use a regular 75- or 100-watt bulb for just a few chicks. You’ll also need some wood shavings, straw or dry leaves to use as bedding, a waterer and feeder, and some chick starter feed. Set the lamp’s height so that the chicks can sleep under it comfortably. When chicks huddle too closely together, it indicates they are chilly and the lamp is too far away from them. As the chicks’ feathers fill in, the lamp should be raised. A clean bed, feeder and waterer are important. Clean and fill as needed. Chickens can be moved to their coop outside when nighttime temperatures remain above 50 degrees. It’s a wise idea to close the coop door every night, as various critters like to dine on poultry. In the daytime, hawks might be a threat. For instructions on how-to construct a small home for chickens, including framing, installing the wall-sheathing, bringing the trusses together and diagrams, check out this article by Mother Earth News. 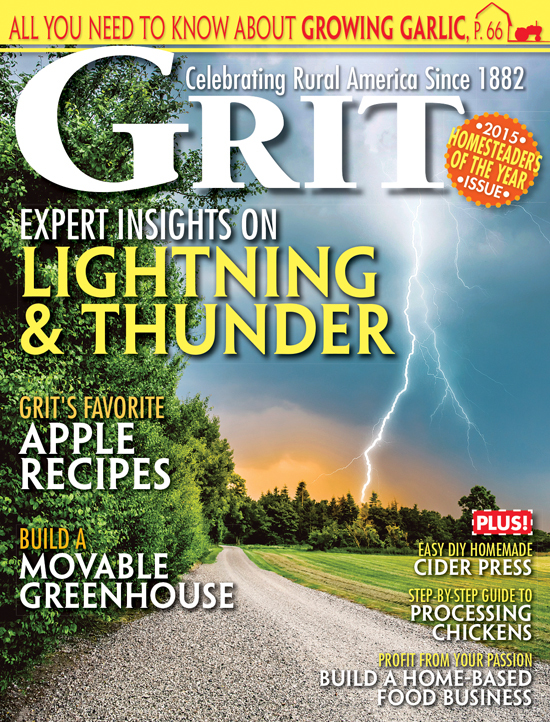 Grown chickens will need a larger feeder and waterer. Using a commercial waterer assures the water will be clean. You can construct a homemade feeder by making a hole in the side of a big plastic kitty litter container. In addition to their feeder full of “laying mash” from the feed store, hens love kitchen scraps, grass clippings and pesticide-free weeds. If the pen is relocated regularly, hens will pick up the gritty sand they need to digest their food, but you can provide a crushed oyster shell supplement to allow extra calcium for strong eggshells. Young hens (called pullets) will begin laying eggs at 20 to 24 weeks old, laying five to six eggs a week. Four hens will provide approximately two dozen eggs a week. Daylight hours decrease in the fall, and so will egg production. In the spring, the chickens will grow new feathers and egg-laying rates will increase. Egg production will drop by about 20 percent annually – but their flavor as stewing chickens will increase! Why not help your chickens out with something they love and something that also helps maintain their good health? Chickens really enjoy taking dust baths, and the dust is helpful in preventing parasites from clinging to their feathers and skin. If your birds have the opportunity to run free some of the time, they might find a good dusting spot on their own. You can encourage a dust bath by placing a deep boxful of dry, loose dirt near their pen, in an area where it can stay dry from rain. If your chickens are kept in a mini-coop all the time, simply place the dust bathtub in the coop as often as you like. If the bottom of your portable coop is open with no wire mesh on the floor, you can just roll the coop over a dusting area of your choice. This is one simple way to help your chickens avoid parasites and maintain good health.